By Chris Williams: WBO 147 lb. champion Jeff Horn is not a happy camper after arriving in Las Vegas, Nevada and discovering that the Top Rank that he’s been given to get ready for his title defense against Terence Crawford doesn’t have air conditioning. Horn (18-0-1, 12 KOs) describes the Top Rank gym as made of tin and brick, and he feels that it’s mind games going on with him being assigned to that gym. Horn thinks he could have hurt himself by working out in the gym for too long in the heat of Las Vegas. The temperatures in Vegas this week are unbearable to say the least. For example, today it was 100 F, and it’s expected to be 105F on Sunday and 107F on Monday. If Horn is going to be working out in a gym without air conditioning, he’s going to have to sleep during the day and workout around 2 A.M. Even that time, the temps in Las Vegas are in the mid-70s. The major question is who from Top Rank or from his co-promoter assigned Horn to that gym? It’ would be interesting to know why they wanted Horn to work out there. It’s unclear where the 30-year-ol Crawford is working out at. Horn should look to train at the Mayweather gym in Las Vegas. They’ve got to have air conditioning, and they likely would be open to letting a world champion like Horn work out there for a week. Horn is defending his World Boxing Organization welterweight title on June 9 at the MGM Grand in Las Vegas, Nevada. The fight will be televised on ESPN. This will be Horn’s second defense of his WBO title that he won last year on July 2 in beating Top Rank fighter Manny Pacquiao by a controversial 12 round unanimous decision in Brisbane, Australia. Many boxing fans think the 38-year-old Pacquiao got the short end of the stick in having to travel to Australia to defend his WBO 147lb title in the hometown of the younger, bigger and stronger 29-year-old Horn. Why Pacquiao ever agreed to fighting Horn in Australia is the real question. It was a strange decision on Pacquiao’s part to agree to do that, and you wonder who dropped the ball by putting the famous Filipino star in that position. Horn roughed Pacquiao up for 12 rounds in winning a decision. It’s believed that Horn will try and rough Crawford up the same way. Of course, if Horn is worn out from training in a hotbox of a gym without air conditioning, it could make Crawford’s job much easier on June 9. Wow, that sounds like a hotbox sauna that Horn was expected to work at. How is the air conditioning not working? That’s what I would like to know. How hard is it to call an air conditioning technician to have it fixed in one day? It sounds crazy. Of course, if the speed bag is totally deflated and the heavy bag in poor condition, then it sounds like the gym isn’t suitable for Horn. I wonder how long the fighters have been training at that gym without air conditioning. Horn shouldn’t have to be stressing out about where he’s going to be training in the last week before the fight. Ideally, Horn should have come to Las Vegas 2 to 3 weeks before the fight instead of waiting until the final week, because it’s more of a stressor getting a situated in the first week in an unfamiliar environment. If Horn had come to Vegas three weeks ago, he would have discovered the conditions at the Top Rank gym, and he then would have found another place to work out after the first week. It wouldn’t have been nearly as big a deal as it is now. Horn plans on applying a lot of pressure on Crawford the entire fight to try and wear him down. Horn realizes that if he lets Crawford fight on the outside at a slow place, he’ll pick him apart. It doesn’t work if Crawford can fight at his own pace unmolested. That’s the mistake that ALL of Crawford’s opponents make. Instead of learning from the mistakes that others have made, Crawford’s opponents do the same thing one after another by letting him dictate the pace, and they all end up losing. Horn is going to do something different by putting massive pressure on Crawford to try and wear him down. Getting Crawford to stand still long enough for Horn to throw his heavy shots is going to be difficult, because the Nebraska native likes to move around the ring a lot. The times when Crawford doesn’t move is when he’s facing a weak puncher. Crawford also does a lot of holding when he faces a guy that he feels as a threat to him. 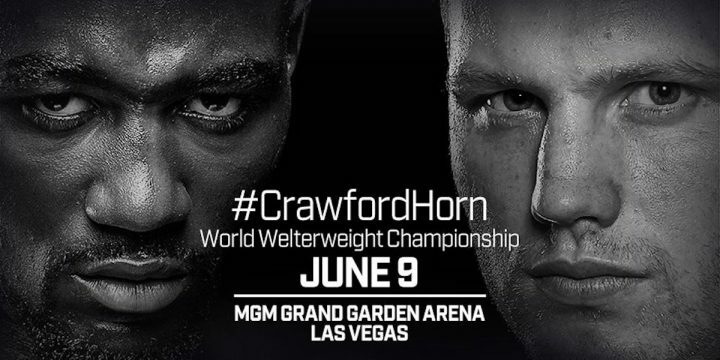 We could see a combination of running and holding Crawford on June 9, which could make it all but impossible for Horn to land anything at all unless he can cut off the ring on him to force the issue. Crawford will likely be heavier for this fight because he’s moving up in weight. It’s possible that the added weight will slow Crawford down, and make him more stationary. Without his movement, Crawford will be like a fly without wings, and he’ll be vulnerable to being swatted by Horn. Carrying around the extra weight won’t be easy for Crawford, because he’s used to rehydrating to 160 for his fights at light welterweight. If Crawford bulks up to 170lbs now, then that’s a lot of new weight that could tire him out and he might gas out in the later rounds.